The BGP policy stipulates that the R5's timer to send BGP advertisements should be set to 10 seconds (default: iBGP=5 seconds, eBGP=30 seconds). Also BGP peer loss should be detected in 15 seconds (default=180 seconds). Also improve the BGP scanner operation by decreasing the default value of 60 seconds to 20 seconds. Hello timer is set to 5 seconds following the rule 3 x keepalive = holdtime. 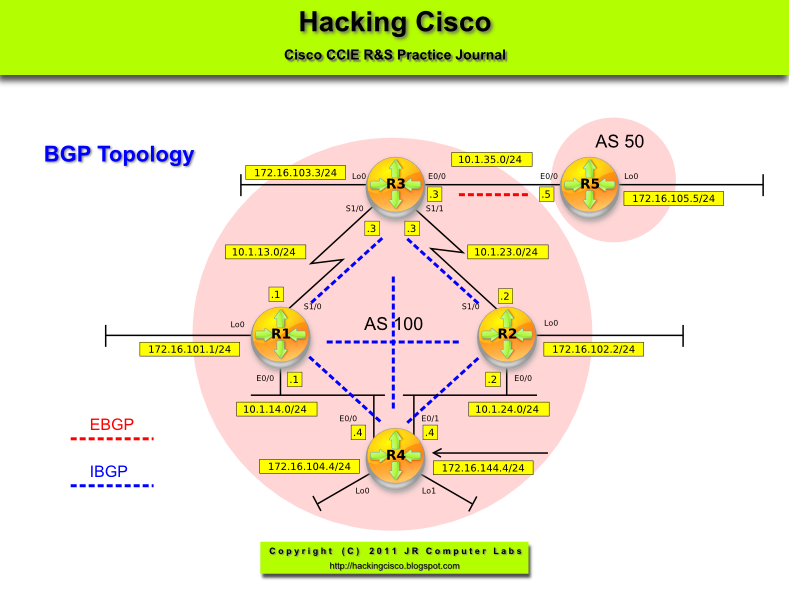 BGP Open - responsible for BGP session establishment. BGP I/O - handles queuing and processing updates and keepalive packets. BGP Scanner - responsible for conditional route advertisements, route dampening, import and export of routes into VRF (MPLS), and confirms the reachability to the NEXT_HOP (the last one is handled now by BGP next-hop tracking). BGP Router - calculates the best path, establishes peers, sends and receives routes and interacts with RIB.